There has been talk of moving some of Apple’s iPad production to Foxconn’s Brazilian site for quite some time. Unfortunately, the deal had been stalled several times since last year due to various issues. MacRumors is now reporting that Apple has finally received certification to sell Brazilian-assembled iPad 2s. Apple will begin selling the Brazilian made 16 GB iPad 2 in Brazil alongside the Chinese-assembled models. The main difference, as we've talked about before, is that many Apple devices retail for more than double their retail price due to the tax on imported electronics. Even though only one domestic model will be available at first, it should sport a significantly less tax, which will undoubtedly make it a hot buy. Certifications for all models of the new iPad are pending for models assembled in both Brazil and China. It looks as though Apple is planning to launch the new iPad with domestically assembled units available, but, ultimately, it is at the mercy of the certification process. Because of the pending status of certifications, Apple has not announced a launch date for the new iPad in Brazil. 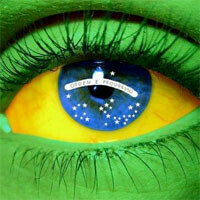 Finally people will be able to afford apple products in Brazil. Now if only more Brazilians knew other products offer essentaily the same quality as Apple. First, it is not unique to Apple, the Brasilian law gives the tax reduction to ALL tablets who produces a percentage of their products on Brasil (many android tablets also got this reduction). Second, the price may not even drop, it is not required for them to drop. Like the iPhone4 which was produced in Brazil, it was sold for the same price as the ones produced in China, even though it was produced in a "zone" (Zona Franca de Manaus) where also have tax reduction. Unfortunatly and most likely Apple will enlarge their profit rather than reduce the price. Obs. Want an more comical fact about Apple in Brazil?? see this link:http://goo.gl/FQYHI Translate with google on any other thing. Long story short, the guy bought one iphone4S and got an atonishing rock.